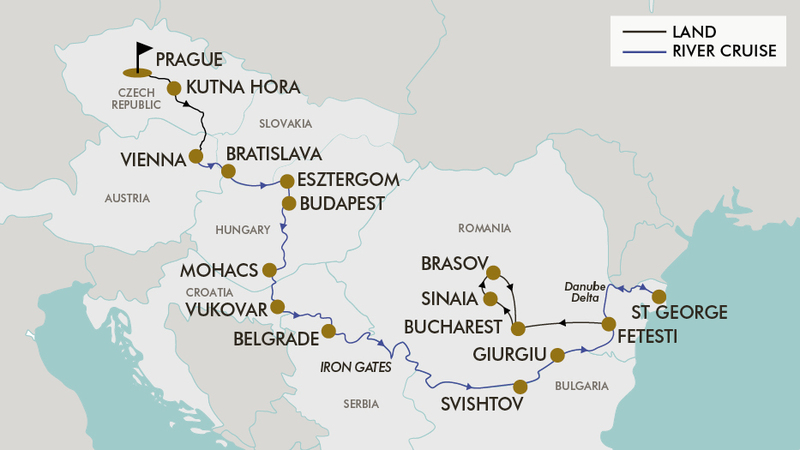 Romania, Bulgaria, Serbia, Hungary… the wonders of Eastern Europe are yours to discover in the most glamorous way possible - a luxury five-star river cruise along the scenic Danube River. For 18 magical days, this tour will take you behind the curtain on a true journey of European discovery. Stroll through the romantic old town of Prague, renowned for its grand bridges and atmospheric squares; journey through scenic landscapes to the city of Kutna Hora, home to an impressive number of cathedrals; and on to Vienna, the vibrant capital of Austria. After taking in the sights, embark on an eight-night river cruise aboard the Amadeus Queen - an innovative 5-star ship with chic furnishings, an indoor swimming pool, and sophisticated, gourmet dining. Cruise along the Danube to Bratislava, home of the impressive Bratislava Castle; visit Budapest, long referred to as the ‘Paris of the East; be surprised by Belgrade, the culturally rich capital of Serbia and much more. The fun doesn’t stop there, however, with the tour continuing through Romania by land. Learn about the Dracula myth at Bran Castle, visit the mountain town of Sinaia, explore Bucharest, beautiful Brasov and more! This once-in-a-lifetime journey includes return international flights, seven nights 4-star hotel accommodation on tour, and gourmet dining aboard the Amadeus Queen, as well as free-flowing beer and wine with every lunch and dinner on the cruise, English-speaking guides and more. Today depart for your overnight flight from Sydney, Melbourne, Brisbane, *Adelaide or *Perth to Prague, Czech Republic. Fly with award-winning airlines such as Etihad Airways, Emirates, British Airlines or Singapore Airlines to name a few (subject to availability). Please note: Due to flight scheduling and availability, some departures may occur on day 2 to arrive day 2. Affected customers must be at the airport on day 2 of the itinerary. Flight times will be indicated on your final documentation which you will receive prior to departure. Welcome to the beautiful city of Prague. Upon arrival, be met by a representative and transferred to the hotel. The remainder of the day will be at leisure. After breakfast enjoy a guided walk through Prague, known as the ‘City of the Hundred Spires’. At the heart of the city is the Old Town Square, renowned for its colourful Baroque buildings, Gothic churches, and the medieval Astronomical Clock, which gives an animated show on the hour. Completed in 1402, the beautiful pedestrian-only Charles Bridge is lined with statues of Catholic saints. See the city’s most important sights on tour, including Wenceslas Square, the National Theatre, the Lesser Town and Hradčany with Prague Castle, Charles Bridge, the former Jewish district, and the Astronomical Clock in the Old Town Square. The afternoon is free at leisure. Enjoy breakfast at the hotel before departing for Vienna. Stop at Kutna Hora, known for the Gothic St. Barbara’s Church with its medieval frescoes and flying buttresses. Don’t miss the breath-taking Santa Barbara Cathedral (entrance not included) or the Sedlec Ossuary ‘Bone Church’ (entrance not included). In the late afternoon continue to Vienna, where you will check-in to your hotel. This morning, enjoy a walking city tour in the ‘Imperial City’ of Vienna with your tour leader. There is much to see in this vibrant capital city: its imperial palaces, the impressive buildings along the Ringstrasse, St. Stephen Cathedral and the famous Vienna Opera among many others. In the afternoon be transferred to the Danube port of Vienna for your cruise embarkation at 4:00pm. The friendly crew of the Amadeus Queen will be awaiting your arrival. Enjoy time to appreciate the features of your cabin, as well as the ships gorgeous swimming pool. Soon after, the Cruise Director will invite you for a welcome cocktail followed by a specially-prepared welcome dinner. The cruise will stay docked in Vienna for the night. The ship will depart Vienna at 2:00am and spend the night cruising for an early arrival into the Slovakian capital of Bratislava before breakfast. This romantic city, with its impressive Gothic and Baroque buildings, is best explored in the morning. Enjoy time at leisure to experience the city, which is dominated by the imposing Bratislava Castle high above the streets below. Alternatively, join an optional shore excursion - City Tour of Bratislava (not included). Stroll to the historic city centre, where you can admire sights such as the Primatial Palace and St. Martin’s Cathedral. After breakfast, you can join a guided tour to Esztergom and Szentendre – two towns which, though vastly different, are equally fascinating. In the former Hungarian capital of Esztergom you follow the footsteps of Hungarian kings and clerics, while the artists’ town of Szentendre is unique due to the many museums and contemporary galleries housed there. Passengers who choose to remain on board will, in the meantime, continue to Budapest, where those who opted for the tour will rejoin the ship for lunch. You arrive in Mohacs early in the morning, and depart again directly after breakfast, heading towards Croatia. Your cruise ship reaches the eastern Croatian town of Vukovar after lunch. You can take an optional city sightseeing tour, followed by a breath-taking optional excursion to the Kopacki Rit Nature Park. This 18-hectare nature reserve, situated at the confluence of the Drava and Danube Rivers, is home to a diverse bird population and provides a protected environment for many species of plants and animals. Explore this wetland by boat and enjoy the unspoilt beauty of nature before returning to your Amadeus ship for dinner. The ship departs for Belgrade during the night. This morning arrive in Belgrade. Known as the White City, Belgrade is one of the most historically rich cities in Serbia, and sits at the juncture of the Danube and Sava Rivers. Highlights of the city include the Parliament, Terazije Square, the Palace of Princess Ljubica, and the St. Sava Temple - the largest Orthodox Church in Serbia. The city has a vibrant pedestrian area with plenty of shops and markets to browse. To sample the local cuisine, head to Skadarska Street (Skadarlija), a popular dining precinct where the spirit of Old Belgrade is alive and well. Explore the city at leisure, or take the opportunity to join the optional shore excursion - Morning city tour of Belgrade (not included). Tonight, continue cruising along the Danube. Admire the changing scenery as the ship makes its way around river bends and through the Iron Gates – a picturesque passage named for the two hydroelectric dams that control the water flow. Watch from the deck as the vessel passes through the narrow gorge between the Carpathian and Balkan Mountains which forms a natural border between Serbia and Romania. Keep an eye out for the many caves and rock sculptures hidden among the steep hills overlooking the Danube. Recount the spectacular day with your fellow travellers over dinner. Spend the morning cruising the Danube River through the Bulgarian countryside, gazing out upon delightful homes and colourful villages from the comfort of the ship’s deck. Those who wish can take part in an on-land optional excursion to Veliko Tarnovo and Arbanassi (not included) will begin the tour from Svishtov and includes an exciting morning filled with culture and history, as well as lunch in a local Bulgarian restaurant. The ship will continue to Giurgiu, where those who opted for the optional tour will meet back up with the cruise. After lunch, the journey continues downriver and in the evening you can enjoy a festive Gala Dinner with your captain and an evening program which will be an atmospheric close to the day. The natural beauty of the Danube Delta is on full display today. Spend the morning cruising Sfantu Gheorghe (Saint George), one of the three main channels that make up the Danube Delta. At the meeting of the Black Sea and the Danube, this UNESCO site hosts seven different ecosystems and is home to many unique species of birds, fish and other creatures. From the fisherman’s village of Saint George, observe daily life for the people who inhabit this fertile delta. Today take the opportunity to join the optional shore excursion - the Delta Safari (not included). During breakfast, reach the Romanian town of Fetesti, where you leave your floating hotel. After disembarking, you will be transferred to Bucharest, and check in at a centrally-located 4-star hotel. Thereafter, you can take part in an optional sightseeing tour through this vibrant city (not included), which has two million inhabitants and a unique charm thanks to its eclectic mix of buildings from different eras. Enjoy a guided panoramic bus tour of the capital, which has often been referred to as ‘Little Paris’. See its main attractions including The Parliament, Arcul de Triumf (identical to the Arc de Triomphe from Paris), Lipscani (a neighbourhood that will remind you of Paris), and more. The remainder of the day is free to spend at leisure. Enjoy breakfast at the hotel, then transfer to Sinaia by bus. Situated in the historic region of Muntenia, Sinaia was so named after the Sinaia Monastery, around which it was built. The town is characterised by its crayon-coloured wooden houses, contrasted with the ‘wedding-cake’ style of its grander 19th-century buildings. Here you will see the Peles and Pelisor Castles and the Sinaia Monastery (entrance not included). Once home to Romania’s first king, Carol I, who created a summer retreat here, Peleş Castle is a dream of fairy- tale turrets and hidden passages. Enjoy time at leisure for lunch (not included) and then transfer to the city of Brasov in the Carpathian Mountains of southern Transylvania. The city is home to Bran Castle, better known as ‘Dracula’s Castle’. Enjoy a panoramic city tour by bus and a walking tour with your tour leader, taking in the main attractions of this medieval city. The Rope Street, The Black Church, The First Romanian School, and the old town are just a few of the city’s highlights. After the tour check in to the hotel. Following breakfast at the hotel, enjoy the sights of Brasov. Learn the story behind the Dracula myth with a visit to Bran Castle (entrance included). Be transported back in time with a visit to the village museum, and learn how the farmers of this region used to live in days gone by. Continue the journey with a visit to Rasnov Fortress (entrance included). From the top of the fortress you will be able to admire stunning views of the Carpathian Mountains and surrounding villages. In the evening, enjoy dinner in a local restaurant. Taste traditional Romanian food in a gorgeous building served along long wooden tables; the restaurant’s mouth-watering fare ranges from ciorba soups to huge portions of meat. Today after breakfast depart back to Bucharest and enjoy the rest of the day at leisure in the historic city of Bucharest, a dynamic, energetic and fun capital. After breakfast transfer to Bucharest Airport for the return flight home to Australia. Please note: some flights may arrive +1 day later due to flight scheduling. After purchase, you will receive a receipt and a Purchase Confirmation, directing you to an online Passenger Information Form. The Passenger Information Form must be completed within 72 hours of purchase. Any special requests, preferences and optional extras MUST be clearly stated in your Passenger Information Form. Any change requested after submitting your Passenger Information Form cannot be guaranteed, is strictly subject to availability and will incur surcharges as outlined in the Schedule of Fees below. On purchasing this Travel Offer you are bound by the General Terms and Conditions, in addition to the specific terms and conditions outlined in this Important Information. Please note: all additional charges are payable direct to your Travel Consultant in AUD (unless otherwise stated). Travel offer is valid for travel on the 25th July 2020. This travel offer is priced for one person based on twin share. For solo travellers a mandatory single supplement applies. Please note: One way flights can not be accommodated. Travellers must take all included flights within the package, and any flights intentionally forfeited will result in later flights being subject to cancellation. - This fee does not include extra nights accommodation, meals or airport transfers. - No flight booking changes or cancellations permitted after air tickets have been issued. - Flight changes are subject to availability at the time of booking. - An outbound and inbound stopover may be chosen; however the stopover location must be the same each way, due to the airline used. - Abu Dhabi stopovers are not available for Perth departures due to Etihad no longer flying out of Perth from October 2018. - Stopover packages are subject to availability. - Premium Economy: Not available. - All Premium Economy and Business Class upgrades are subject to availability (if we are not able to fulfill your business class request the upgrade cost will be refunded). - On any upgrade purchase, short haul flights and domestic flight sectors are not guaranteed in a Premium or Business cabin; subject to aircraft configuration. The Amadeus Queen is the 15th river cruise ship in the Amadeus fleet sailing on the Danube, Rhine and Main rivers as well as the Dutch and Belgian Waterways starting in the Spring of 2018. This new vessel follows the award-winning model of the Amadeus Silver ships but offers even further innovative developments. The popular concept of spaciousness has been maintained. This includes not only generous public areas but also spacious cabins: 12 large suites impress with an outdoor balcony and a cozy reading corner whilst the 69 standard cabins mainly have panoramic window fronts which can be automatically lowered and luxurious bathrooms. A new on-board highlight is the indoor pool, the roof of which can be opened in fine weather. In the evenings, this area may also be used for informative talks, functions and cinema showings. All cabins are subject to availability. Panoramic windows (cannot be opened), (16 m² / 172 sq.ft. ), Spacious bathroom, wardrobe, choice of bed configuration (double or twin bed), flat-screen television, individual climate control, en-suite bathroom with shower/WC, hair dryer, direct dial telephone and in-room safe. Floor-to-ceiling sliding glass doors with French balcony, (17.5 m² / 188 sq.ft.). Spacious bathroom, drop-down panoramic window, mini-bar, walk-in wardrobe, choice of bed configuration (double or twin bed), flat-screen television, individual climate control, en-suite bathroom with shower/WC, hair dryer, direct dial telephone and in-room safe. Please note: Accommodation/rooms offered are based on a lead-in room type, and are subject to availability based on seasonality. Properties will be confirmed, no later than two weeks prior to travel. Please note: extra nights are based on room only and subject to availability until the time of booking. Airport transfers are not included if you wish to arrive early or stay behind. 2 people (subject to availability). - No child discounts. Full price applies for all children travelling with their parents. - Valid for Children/infants 2 years old and over. Please note: Children must be accompanied by a responsible adult 18 years old and over to travel. No unaccompanied minors allowed. Double or twin bedding (subject to availability). Subject to availability and at the hotels discretion. Please enquire on booking if you require this option. Minimum group size 25, maximum group size 50 per vehicle. - Some tours require minimum numbers to operate. Please note: A comprehensive travel Insurance policy must be organised BEFORE all details can be finalised. Often locals with intimate knowledge of an area, its culture, and history. Their role entails providing commentary, routing the tour, and seeing that people have a good time. They are a licensed, qualified expert who supplies specific information on history, art, architecture and culture of the city/village/attraction in which he or she is guiding the tour. The guide meets the group at the required place and leaves the group at the end of the tour, they do not travel with the group. An experienced person tasked with ensuring the smooth operation of tours, as well as providing practical support to passengers throughout the whole trip. Their role primarily includes assisting with accommodation, transportation between locations, and communication with tour guides in each stop. A tour leader may provide general guidance around a city or village, and offer information on the place visited on the bus, however they are not required to have specific knowledge on art, architecture, or history. They are not allowed to provide a guided tour or commentary of a city/village/attraction once there and if caught doing so, can be fined. Please note: Tour leaders/guides are not a standard inclusion in all travel offers. Tour leaders/guides will only be made available when particularly required to enhance the experience of the destination featured. The average high in Eastern Europe and Balkans during July’s 28ºC, cooling to 18ºC at night. Its summer season one of the best time to travel through these destinations. At TripADeal we do not arrange seat selection. It is important to highlight that some Airlines do not allow pre-selected seats. We strongly suggest you contact the Airline directly with seating allocation requirements and or arrive at the airport earlier to arrange your seating. While we do not add frequent flyer member details to bookings, you can do this directly with the Airline once you have your flight information. Customers are required to provide valid passport details either at the time of purchase, or no later than 45 days prior to departure date. Failure to do so may result in cancellation of the booking. In this instance customers will be responsible for any costs and fees incurred. - Begins approximately 2 hours after docking. - Due to security reasons, all guests must be on board 2 hours before sailing. - Itineraries are subject to change at any time without notice. - Check your specific sailing for exact departure and arrival times. All times are local to the port. Breakfast is included in the tour, for all other meals; lunches and dinners the tour leader (when available) will offer assistance with reservations, suggestions and directions to local restaurants. It is your responsibility to notify TripADeal of any dietary requests/requirements. Please note; we will do our best to meet your requests/requirements, however cannot guarantee that we will always be able to. You will be responsible for all your personal belongings whilst on the tour. With regards to luggage, you must carry your own luggage from the coach to the hotel room and back to the coach. The driver will assist with the uploading and off-loading of the luggage from the coach. Our vehicles are not equipped with wheelchair access, so unfortunately our tours are currently not suitable for wheelchair users and those less mobile. Please note: a general level of fitness will be required. If you have any concerns please consult your healthcare provider prior to purchase/travel. Please note: In the event entrance to a site is affected by changes in operating hours or public holiday closures, your itinerary will be adjusted to ensure you do not miss out on the experience. Shopping overseas can be a daunting and confusing experience, especially when there is a language barrier. Please be very cautious when foreign currencies and prices are involved. If paying by credit card, please pay close attention to the amount you are being charged and keep all of your receipts. Do not make any purchases you are not comfortable with or feel pressured into. If you are uncertain or need assistance with the language barrier, please seek assistance from your Tour Guide/Leader. Please refer to our Terms and Conditions in regards to shopping for further information. Please note: Passengers who are not Australian citizens must check with the respective consulate or visa agency to determine what their visa requirements are and what personal identification is required. It is also important to note, some areas of employment such as journalism, government authorities and charity organisations may have additional restrictions in applying for Visas. This may in turn affect the type of application required. We are proud to offer a range of travel insurance products - please ask your Travel Consultant for more information. This includes booking changes requested by you, including but not limited to those changes requiring an airline ticket or a Purchase Confirmation reissue. · 1st Change - $100.00 per person + any additional charges applied by the airline/cruise company/accommodation/other travel provider. · 2nd Change - $150.00 per person + any additional charges applied by the airline/cruise company/accommodation/other travel provider. · Subsequent changes - $250.00 per person + any additional charges applied by the airline/cruise company/accommodation/other travel provider. · Changes within 30 days of departure $350.00 person + any additional charges applied by the airline/cruise company/accommodation/other travel provider. · Changes within 14 days of departure $500.00 per person + any additional charges applied by the airline/cruise company/accommodation/other travel provider. · If the incorrect name has been advised to TripADeal, charges of $150.00 per person + any additional charges applied by the airline/cruise company/accommodation/other travel provider. Typically our prices are based on Twin Share. For Solo Travellers a single supplement is mandatory. For privacy reasons, TripADeal is unable to offer a roommate pairing service. You have selected Twin Share Traveller, which means you will later need to provide the name of your travel partner. TripADeal does not provide a roommate pairing service. If you do not have a travel partner, you must select Solo Traveller here before continuing.